Wet Republic is arguably The Best Day Pool Party in Vegas. Located at the iconic MGM Grand Resort and Casino Las Vegas, join all the other guests in the fun with 54,000 square feet of pool party space, private beds and VIP cabanas and multiple saltwater pools for your enjoyment. Open almost every day of the week during the Spring and Summer, sit back and relax with this discount code. Don’t miss out on one of the largest Vegas pool parties. 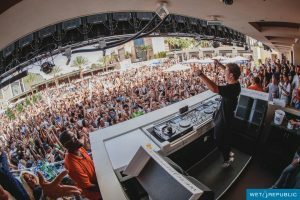 Wet Republic is huge so you can easily have the best time possible while Top 100 DJs and Music Artists entertain you all day at The MGM Grand Las Vegas. 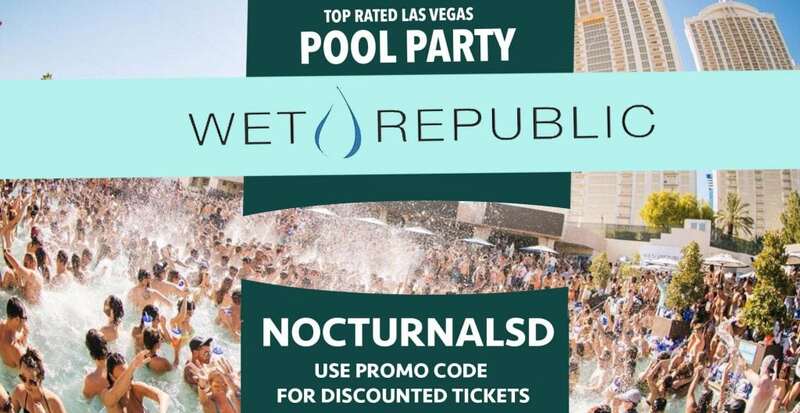 Get your Wet Republic Discount Tickets and Discount Wt Republic VIP bed, and Discount VIP Cabana tickets using Promo Code “NOCTURNALSD”. Wet Republic access is in such high demand that Guest lists are virtually nonexistent. But, we can help by offering Discounted Wet Republic Presale Tickets for any day of the week. Use Promo Code “NOCTURNALSD” when you buy your Wet Republic General Admission Tickets and VIP passes. There is always something huge planned on Wet Republic Event Calendar. Choose events including weekly residence DJs like DJ Shift, Fergie DJ, or any of the A class headliners on the weekends. Wet Republic Events are constantly being updated HERE! Wet Republic offers one of the coolest and private VIP sections right in view of the main action. Choose from small group options like a VIP bed, VIP Booth, and VIP Cabanas with private pools so you enjoy the fun away from the crazy crowds. Don’t forget to use your VIP Discount Code “NOCTURNALSD” for your Wet Republic VIP Bottle Table Service. Inquire about availability HERE! Some of the best DJs and Music artists in the world play at Wet Republic. Come have a one in a life time experience and see talent like Tiesto, Zedd, Marti Garrix, Steve Aoki, Lil John, Cash Cash, and more! Come see all the Wet Republic Lineup Set Times HERE! There is no better Las Vegas Day Pool Party Venue than Wet Republic. MGM Grand hosts one of the largest spaces with multiple Private VIP Cabanas, and center pool for your all Day Pool Party. Purchase your Las Vegas Wet Republic tickets today and don’t forget to save with Promo Code “NOCTURNALSD”. Wet Republic is an amazing venue to host your next Bachelor Party. With special offers for Birthday Parties, and Bachelorette Parties, why not take advantage and experience The Day Club in Vegas.